Moscow, December 13, Interfax – The holy relic of the Gifts of the Magi, preserved in the Monastery of St. Paul on Mount Athos, will be taken to Moscow, St. Petersburg, Minsk and Kiev for the Orthodox Christmas holiday in January 2014. 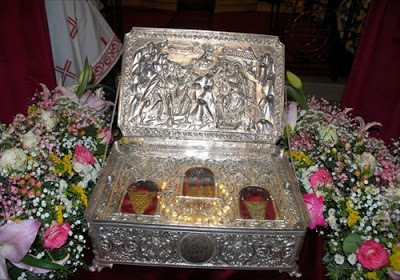 The relic will be on display at the Cathedral of the Christ the Savior in Moscow from January 7 to January 13, in St. Petersburg’s Resurrection Novodevichy Monastery on January 14-17, in the House of Mercy in Minsk, the capital of Belarus, from January 18 to January 24, and in the Monastery of the Caves in the Ukrainian capital, Kiev, from January 25 to January 30, the Moscow Patriarchate’s press service said on Friday. It is one of the few holy relics associated with the life of Jesus Christ that have survived in the world. It will visit Russia, Ukraine and Belarus with the blessing of Patriarch Kirill of Moscow and All Russia. The legend says that the three Magi (Wise Men) visited Jesus after his birth, bearing him gifts of gold, frankincense and myrrh. The Gifts of the Magi stayed in Jerusalem until the 4th century, when they were transported to Constantinople and were placed in the Hagia Sophia Cathedral. Archbishop Antony of Novgorod mentioned the Gifts of the Magi in his book in 1200. Following the fall of Constantinople, the relic was brought to Mount Athos, where it has been preserved since then. The relic includes 28 small artfully decorated golden pendants of different shapes.